Home aquariums frequently fall prey saltwater ich, also known as white spot disease. Caused by a parasitic protazoa, Cryptocaryon irritans, saltwater ich is easy to identify by the characteristic white spots, around 0.5 to 2.0 millimeters in size, that typically appear first on a fish's pectoral fins. However, if the disease infects a fish's lungs, the visible fin spots may be lacking. If this instance, the main symptom is respiratory distress, lethargy, or irritation. The best ich treatment is copper-based medication. Before treating the tank, move the sick fish to a bare bottomed quarantine or treatment tank. Here are five treatments for white spot disease. 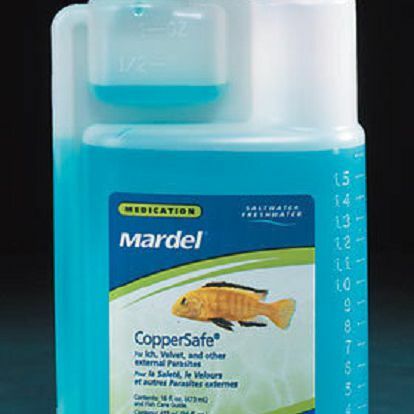 Coppersafe from Fritz Aquatics Mardel treats both freshwater and saltwater ich, along with other diseases, including Velvet and additional parasites. However, because it is a copper-based treatment made from chelated copper sulfate, any invertebrates in your tank must be removed before using the product. Consider removing plants and snails, too, as the medication could be harmful to them, as well. To use Coppersafe, add 1 teaspoon of medication for every 4 gallons of water, or 1 cup of every 190 gallons. The solution will remain active in the tank for more than one month. Cupramine, a copper-based treatment from Seachem, treats not only saltwater ich, but also other ectoparasites in freshwater and saltwater tanks. An ionic medication (rather than chelated medication) it's non-acidic and doesn't contaminate the filter bed; however, invertebrates still need to be removed from the water before treating. To use Cupramine, turn off UV filters and ozone filters, and remove chemical filtrations. For every 10.5 gallons of water, use 1 mL of treatment, and then wait 48 hours. Repeat the treatment, and leave at this concentration for 14 days. Test the water for copper levels before redosing the tank. If you're sure that it's a parasite that's infecting your saltwater tank, treat it with Stop Parasites, from the Chem-Marin company. If you're not 100 percent sure that it's ich causing the problem, use erythromycin along with this product. Before using Stop Parasites, disengage any filtration systems that remove particles smaller than 25 microns. Then, add 1 teaspoon of Stop Parasites per 10 gallons of water twice daily for five days. This particular product is reef-safe. It can also be used when you bring a new fish home by adding 5 drops of the medication to the acclimation container, and then another 5 drops to the tank twice a day for four to five days to prevent stress-induced parasites. If you need a copper-free treatment for saltwater ich, try RALLY from Ruby Reef. It's made from acriflavine, aminoacridine, and formalin, so it's not harmful to fish, invertebrates, or corals. However, it might not be the top treatment for C. Irritans, so you may need to combine it with an alternative treatment, such as KICK-ICH—another copper-free treatment from Ruby Reef. RALLY does, however, succeed at treating other external parasites, such as dinoflagellates and flukes. To use RALLY, remove carbon filtration and other absorbent media, and turn off protein skimmers and UV sterilizers. Use 1 ounce of RALLY per 5 gallons of water per day for three days. If you prefer to avoid medication, try an alternative treatment for ich. Fish hobbyists often use osmosis to achieve hyposalinity, which means taking down the salt level to around 10 percent seawater strength by diluting water in a quarantine tank by 5 percent every hour. Once the water is at 10 percent strength, hold it there for three hours, and then reverse the process by increasing the salinity by 5 percent every hour. Repeat the process every three days.